These stuffed peppers contain lean ground bison, meaty mushrooms and chewy farro to create a hearty, satisfying twist on a comfort food classic. Anyway, my husband recently requested stuffed peppers so I decided to create a meaty, protein-packed stuffing. We had ground bison on hand (my newest obsession), some leftover cooked farro and mushrooms. If you’ve never tried ground bison, it tastes just like ground beef (much more so than ground turkey) but it has fewer calories and less saturated fat and cholesterol per serving. 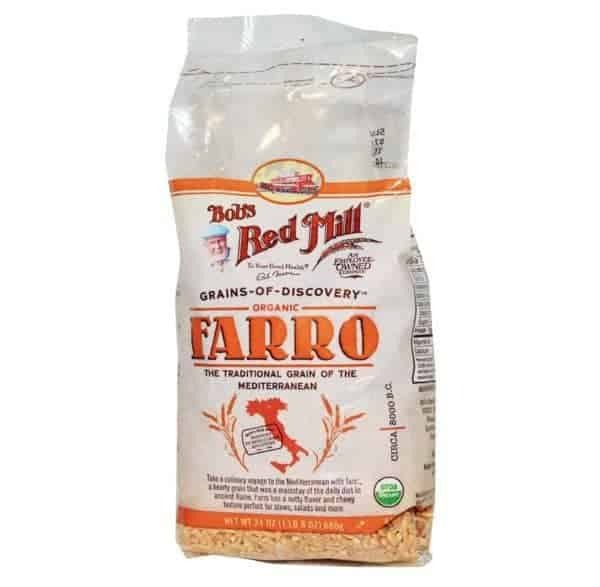 Farro is one of my husband’s favorite ancient grains and it’s packed with protein and fiber. It’s much more nutritionally dense than brown rice or white rice so I decided to use it in these peppers. Feel free to swap with anything from bulgur wheat to quinoa to white rice to spelt! The goal is to simply turn whatever you have on hand into a new and delicious dish your whole family will love. Lean ground bison, meaty mushrooms and chewy farro create this hearty, satisfying twist on a comfort food classic. Pre-heat oven to 350 degrees and place red pepper halves in a large glass baking dish; set aside. Heat a large sauté pan over medium heat. Spray with cooking spray and add diced onion and carrot. Cook onion until softened, 3-4 minutes. Once mushrooms have lost most of their moisture and bison is nicely browned and starting to form a crust (after about 10 minutes), stir in the tomato paste. Use wooden spoon to help incorporate paste into the meat mixture. Pour in the tomato sauce and cooked farro. Stir to combine and cook for an additional 2-3 minutes until mixture is warmed through. Check for seasoning and adjust accordingly before removing pan from the heat. Fill each pepper half with a heaping half cup of the bison and farro mixture. If there is leftover mixture simply add it to the pan around the peppers. 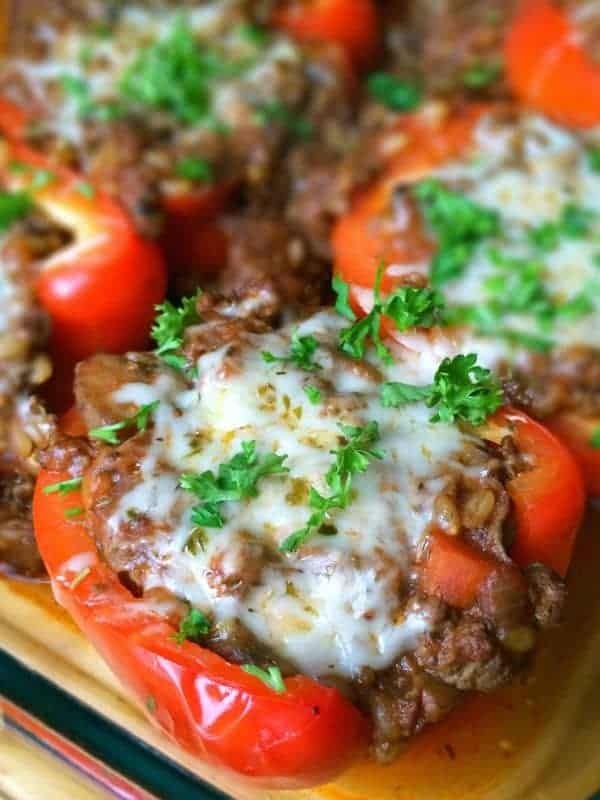 Sprinkle a tablespoon of shredded parmesan on top of each stuffed pepper. Cover pan with foil and bake until peppers are soft, about 30-40 minutes. Optional: Once peppers are cooked, remove foil from the pan and broil peppers for 30-60 seconds to brown the cheese and form a bubbly crust on top. Garnish with freshly minced parsley to serve. LOVE Bob’s Red Mill Farro. It’s such a nice change from brown rice/quinoa/brown rice again. And now I’m thinking I need to give ground bison a try. Hope I can find it at my store. This sounds amazing! I have a pack of ground bison in my freezer though it may be passed its prime & freezer burnt. (Shame on me, i hate wasting anything!) Alas, i bet venison (in this case, white-tailed deer) meat would be scrumptious in this recipe as well! In our house we eat more venison than farmed meats which is very lean & loaded with fiber. I cant wait to give this recipe a whirl! Yum! Venison would be great too! Let me know what you think! Oh I hope you try it! I know you’ll love it! 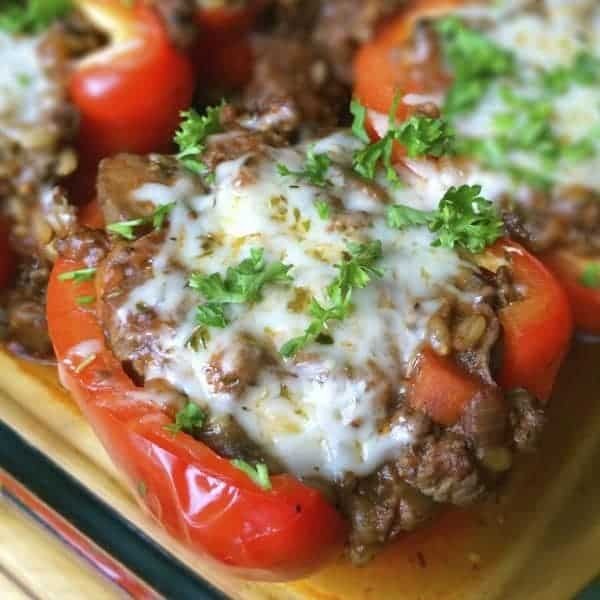 Love how meaty and filling these look and damn I love stuffed peppers! Bison is a new obsession of ours, too. We recently traveled to our local bison farm and stocked up. The steak is amazing. I’ll be making a roast in the slow cooker this week. Love these peppers! I’m jealous of your bison roast!! Love that you put farro in these peppers! These look fantastic! I’m obsessed with stuffed peppers yet haven’t made them in forever! We are so farro obsessed lately!! It’s crazy!! I hope you like these – my boys devoured them! Farro is a favorite of mine and these stuffed peppers look incredible! Bison is such a wonderful protein. Great recipe! I agree – I am so smitten with bison! Oh man I could definitely eat one of these or maybe two. I might have had three…woops! I’m in love with this recipe but especially excited by the grape leaves recipe. I was just walking through whole foods the other day thinking what a shame it is that I couldn’t have grape leaves anymore and didn’t think to look up a paleo option! Thanks! Grape leaves are the best!!! Let me know how you make yours! We use ground bison/buffalo quite frequently too but I haven’t tried stuffing a pepper with it yet. This sounds so tasty + hearty! I need to use it more often!! It’s my new favorite! !